For this week’s photo challenge the prompt is the word “enveloped”. I understand it to mean totally surrounded or covered, and as such I could only choose one photo as illustration. 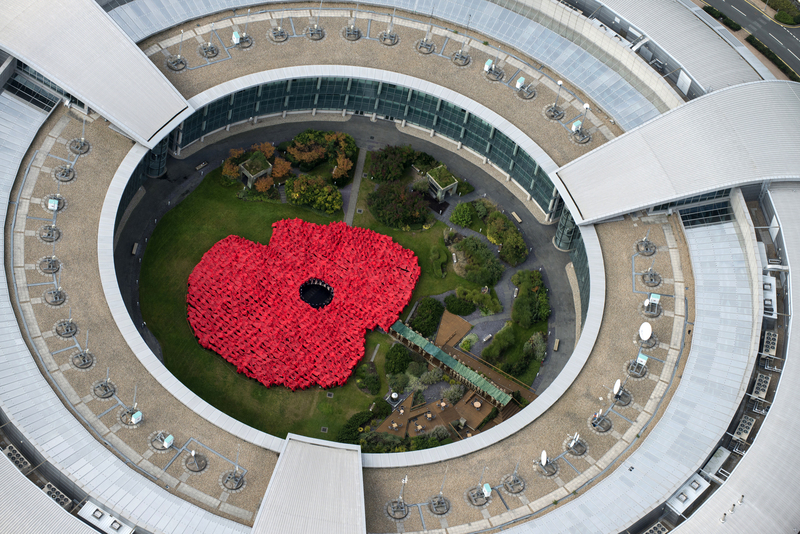 I did not take the photo, the copyright belongs to the Government Communications Headquarters, GCHQ, but I was given permission to use it for this blog. The photo shows the entire doughnut-shaped building, which is near my home, surrounded and lit up in the colours of the rainbow. This occurred last weekend (17th May 2015) on Sunday evening from 9pm as the sun set. It was to mark the International Day against Homophobia, Transphobia and Biphobia. It was amazing in many respects. Firstly, that GCHQ would make such a public gesture of solidarity with these misunderstood minority communities; and secondly, that a large crowd of people, including myself, drove, walked, and waited there to see it late on a Sunday evening. I know parents who kept young children up specially to see it and then took the opportunity to discuss the reason for the event. Not so long ago it was illegal in this country for men and women to be practising homosexuals. And it would have been unthinkable to get a job with the security and intelligence services while openly gay. But of course many people did work in these fields while keeping their sexuality hidden. One such man was the mathematician and cryptographer Alan Turing. He worked at Bletchley Park, which was the forerunner to GCHQ. There he and a brilliant young team helped crack Germany’s Enigma Code, which certainly shortened the second world war by a couple of years thereby saving millions of lives. But when his sexual orientation was discovered, Turing lost his security clearance and was convicted for gross indecency. His life was ruined by this conviction and his reputation was destroyed. He was subjected to ‘corrective’ hormonal treatment until, two years later it is believed, he committed suicide by cyanide poisoning. In 2013 he was granted a posthumous pardon by the Queen and honoured for his work. In 2014 the film The Imitation Game was made about Turing and his work. The film is so good that it won an Oscar as well as 51 other awards. Starring Benedict Cumberbatch, Keira Knightley and Matthew Goode, the acting is outstanding. The truth may be stretched a little for dramatic effect, but the film is gripping from beginning to end. My opposition to any form of discrimination and prejudice stems from my years in teaching when I observed the misery it caused to children. During my 30+ years working in the field of education, I taught over a thousand primary school pupils in state schools. It is reasonable to assume that they were a fairly representative sample of children raised during the second half of the 20th century. The majority were from stable, loving and supportive families with parents who worked hard and were able to provide good homes, experiences and opportunities for their children. But over the years I also worked with many children who were not so lucky. Lots of families suffered from the negative effects of poverty through no fault of their own. But in some cases families were dysfunctional due to addictions-to gambling, alcohol or illegal drugs. There was also a criminal element including a small minority of parents who were actually dangerously antisocial. Whatever the cause, the children suffered most. In all those years I only encountered one child with what I would call a ‘wicked’ nature. He took pleasure in inflicting pain and suffering on other children, animals and even his own family. Every available agency tried to help him, his parents, and the school, manage and change his behaviour, to no avail. In those years too I met many confused and unhappy children who had a poor self-image and little confidence. There were as many reasons as children for this; inadequate parenting, poverty, social, emotional or physical issues, learning difficulties, and sometimes gender issues. Someone once explained to me that the gap between how we see ourselves and how others see us is crucial to our self-esteem. School age children are social creatures. They need to be accepted and respected by their peer group. They are not born with low self-esteem. It is an acquired condition. If, for whatever reason, they do not ‘fit in’ to their group, their self-esteem suffers. And they may become victims of bullying. This is enormously important because research has shown that low self-esteem leads to unhappiness, ill health, and a less rewarding and successful life. In extreme cases it can lead to suicide. This brings me to the tragic case of a 15 year old boy who took his own life because he was being taunted at school for behaviour which ignorant bullies called ‘gay’. The effect of this on his family and true friends was so traumatic that some months later his father took his own life and then one of his friends did the same. 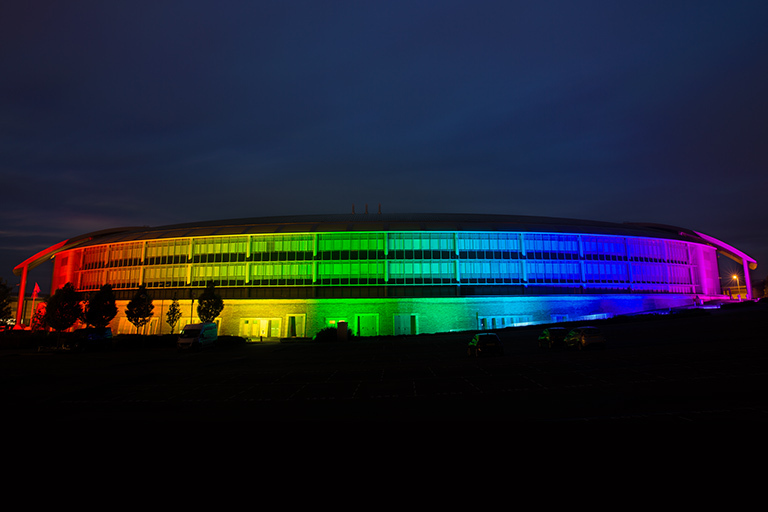 This is why I am so proud of GCHQ for lighting up the ‘doughnut’ building in rainbow colours at the weekend. In this country, and in many others I am sure, the past has been marred by intolerance bred of ignorance and fear. People have been judged because of the colour of their skin; their accent, age, gender, beliefs, finances, job, clothes, or sexuality rather than their humanity. There is no place in a civilised society for such prejudices. Critics have denounced the gesture online as a political gimmick, but if it draws crowds of ordinary families who then discuss these issues with their children then it was a very worthwhile one in my opinion. I have mentioned before that I live near ‘The Doughnut’, which is the local nickname for the building which houses the Government Communication Headquarters, GCHQ. Being an important part of our country’s security service, we rarely find out what is happening inside the building. They are brilliant at keeping things quiet! So it was a great surprise to find that many of the workforce, past and present had taken part in what can only be described as a ‘happening’! The Gloucestershire branch of the Royal British Legion wanted to do something special, unusual and spectacular, to mark the centenary of World War 1 and GCHQ personnel volunteered to help. What they created was certainly spectacular and got quite a lot of press coverage although, unlike the Tower of London installation, no member of the public actually saw it for real! Participants were invited to make a donation to take part and £1730 was raised. The used ponchos were donated to local charities namely a number of scout groups in the local area and Bloodbikes, a charity providing out of hours emergency medical courier service to Gloucestershire and the surrounding counties. In view of the amount of blood transfusions my husband has had recently, I have to say that is a cause very close to my heart. 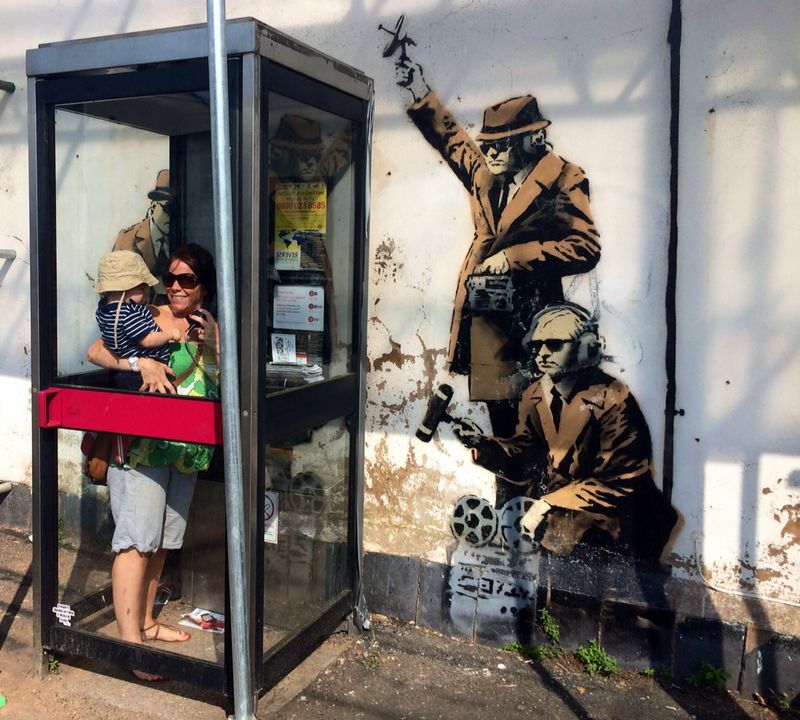 Banksy ~ A rebel with a cause? I recently wrote about our concert at the Tuckwell Open Air Theatre. For several weeks before the concert we rehearsed in a room above a pub in one of the older parts of Cheltenham. 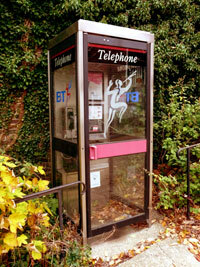 Right opposite the pub, on the corner of Hewlett Road and Fairview Road, was an ugly modern telephone box. 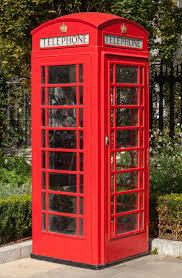 I will never understand why the powers that be got rid of our lovely red telephone boxes and replaced them with these ugly grey plastic things. But I guess beauty is in the eye of the beholder! However, I digress. The telephone box was attached to the side wall of a very insignificant rented house. Insignificant that is until one Saturday night in April this year when a van turned up and a man covered the wall of the house with tarpaulin. 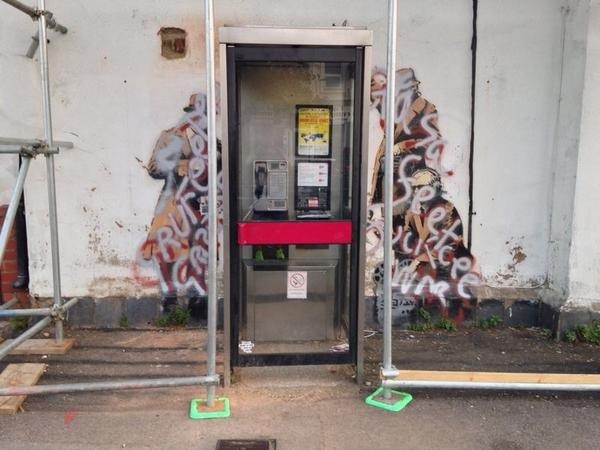 He then proceeded to paint a mural around the phone box which showed three men apparently using listening devices to hear and record the conversations of people using the phone box. The trenchcoat-wearing men were obviously meant to be spies. Now this was clearly a reference to the fact that GCHQ, the Government Communications Headquarters, is based in the town. GCHQ had been controversially in the news because of Edward Snowdon’s revelation that they listen in to private telephone calls, though quite why anyone is surprised by that I fail to see. I may be missing something, but if this is done in the quest to prevent terrorism and serious crime ~ isn’t that their job? When the tarpaulin, the man and the van left, there appeared an amazing piece of very professional street art or graffiti, depending on your point of view. People came from miles around to have their photograph taken inside the Spy Booth including my daughter and my grandson! Of course all of this attention had negative consequences too. The painting was very soon badly vandalised, which is tragic, but also rather ironic as it was originally an act of vandalism itself. The debacle which has rumbled on ever since verges on the ridiculous with the owner, the tenants, the council, local business people, millionaire prospective buyers and art experts all proclaiming their views loudly in the local newspaper. But most residents agree that it livens up a rather dull area, is a tourist attraction and definitely belongs in Cheltenham. It would be irrelevant as a political statement if it were not linked to the phone box and the home of the Government communications Headquarters. Banksy himself has said, “As a kid I always dreamed of growing up to be a character in Robin Hood”. It seems now his street art is so valuable that he doesn’t need to steal from the rich. They are queuing up to buy his work! 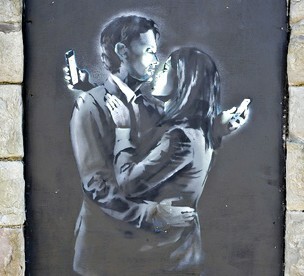 Today I heard that another of his paintings, Mobile Lovers, attached to the side of a community building in Bristol has been sold for a six figure sum and all the money is going to secure the future running of the premises as a Youth Club.